Standards in many state schools are "woefully low" and employers must "pick up the pieces", the boss of the UK's biggest supermarket chain has said. Tesco chief executive Sir Terry Leahy, who is also an education adviser to the prime minister, said his company was particularly concerned about education. "As the largest private employer in the country, we depend on high standards in our schools," he said. The government said that secondary school standards had never been higher. "Sadly, despite all the money that has been spent, standards are still woefully low in too many schools," Sir Terry told the Institute of Grocery Distribution's annual conference. "Employers like us, and I suspect many of you, are often left to pick up the pieces. Sir Terry's views were echoed by other business leaders. 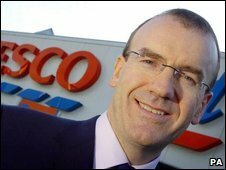 John Cridland, director general of the CBI, said the Tesco chief's concerns were "shared by a wide range of the business community." CBI surveys have repeatedly found that employers are dissatisfied with the level of skills among young people. In 2008, 40% of those questioned said they were unhappy with the literacy and numeracy skills of school leavers - 17% had been forced to provide remedial help for school leavers. This is perhaps hardly surprising when you consider that only 15% of young people leave school to go into jobs when they are 16. They are likely to be among the lowest achievers. More than half of 18-year-olds go on to higher education these days, so even those who leave school to enter the workforce at 18 are likely to be among the lower achievers. In 2008, 40% of 16-year-olds failed to pass their maths GCSE and 37% failed to get English. Even by the time they have reached 19, around 25% of young people have still failed to get five good GCSEs of any sort. But is the situation worse than it was in the past - as many employers seem to believe ? The evidence suggests that school leavers are more numerate and literate than older adults. A CBI education and skills survey carried out earlier this year found that 40% of employers were concerned about the basic literacy and numeracy skills of their workforce. "That's why the CBI is putting so much effort into the partnership between business and education, to tackle these challenges," Mr Cridland added. The British Retail Consortium says employers are entitled to expect "an education system that equips young people with the right skills and mindset for the world of work"
"Yet, retailers spend huge amounts on training school leavers, who often lack basic skills. Retailing provides a range of opportunities for improving skills and developing careers - vital to those the state has been unable to engage," says the consortium's business environment director, Tom Ironside. The government insisted that the quality of secondary education is high. "Standards have never been higher in our secondary schools. The vast majority of people working in education are on the front line, teaching in our schools," a spokesman for the Department for Children, Schools and Families said. Teachers' unions agree that standards are higher than ever, but say state schools would benefit from the same level of funding as the private sector. "The picture painted by Sir Terry Leahy, of woefully low standards in our secondary schools, is plainly wrong," says Christine Blower, general secretary of the National Union of Teachers. "While there is clearly always more that can be done in schools, standards in both educational attainment and teacher professionalism have never been higher, she added.